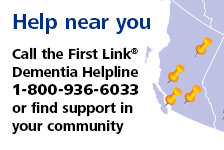 Activities to do with someone with dementia | Alzheimer of B.C. This tele-workshop for family members explains the goals and benefits of activities for the person with Alzheimer's disease. This workshop also examines the different types of activities and explains how to maximize the pleasure and benefit for you and the person with dementia.